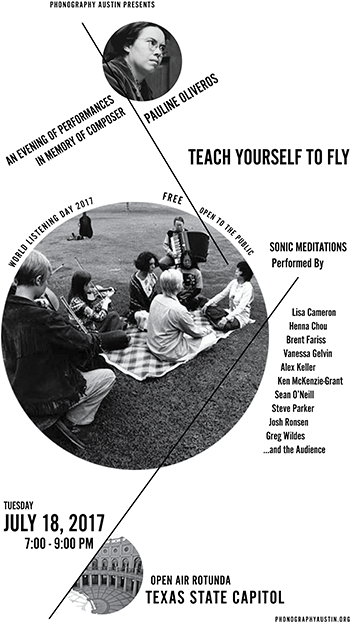 On World Listening Day 2017 (Tuesday, July 18), Phonography Austin will host Teach Yourself to Fly, an evening of performances in memory of composer Pauline Oliveros. 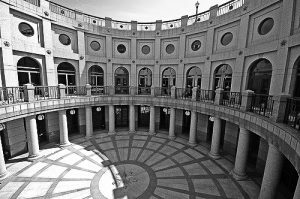 Teach Yourself to Fly will take place in the Open Air Rotunda (officially called the Texas Capitol Extension) at the Texas State Capitol. From 7:00 PM to 9:00 PM. 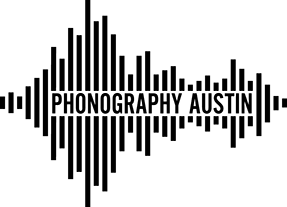 Austin-based artists Lisa Cameron, Henna Chou, Brent Fariss, Vanessa Gelvin, Alex Keller, Ken McKenzie-Grant, Sean O’Neill, Steve Parker, Josh Ronsen, and Greg Wildes will perform selections from Oliveros’ Sonic Meditations with the involvement of the audience. According to her obituary in the New York Times, the open-ended scores in Oliveros’ Sonic Meditations create “a total inclusivity, meant to free music from elite specialists and open it up to everyone, regardless of status, experience, or ability.” Teach Yourself to Fly will honor her intent by inviting the audience to perform alongside the artists. Excerpted scores from Sonic Meditations, which do not require any musical expertise, will be on display.